William Selwood was one of the first generation of lantern clock makers in Britain. He worked in London, 'near Bartholomew Lane end' in Lothbury, a street traditionally housing the workshops of metal workers such as brass founders, copper smiths, pewterers, those who made candlesticks, mortars, and all manner of brass and copper household objects. The name Lothbury is said to be derived from 'Loathbury' arising from the loathsome noises made there from the endless hammering. The Selwood premises were both workshop, sales shop and home, and were known by the 'Sign of the Mermaid' at a time when business premises had symbols rather than street numbers. With such 'shops' the layout was usually that the ground floor front would be the sales shop, the rear the workshop, with living accommodation upstairs - what we nowadays call 'living over the shop'. But the Mermaid was far more than a two-up, two-down. It is thought the Mermaid was also a lodging house, and may formerly, and even still in William Selwood's time, have been a tavern, perhaps retaining its Mermaid sign from earlier times. It would have had to be a large building on numerous floors to accommodate the sheer numbers of live-in staff, as in those days apprentices 'lived in' with their master, and so too did most journeyman, i.e. those 'out of their time' who stayed on as employees. The name of the establishment suggests to me some sort of boisterous haunt for carousing mariners struggling to regain their land legs, but perhaps I have a wrong impression of mermaids and their effect on sailors. Certainly it was a tavern or lodging house in the 1660s when the premises were run by Selwood's successor, Thomas Loomes, who carried on the clockmaking tradition there but also rented rooms and was described as the 'landlord'. The other clockmaking houses which later opened up in Lothbury, had names which seem to me much more respectable - the Dial, the Cross Keys, the Golden Ball, the Drapers' Arms, the Three Chairs. The name, William Selwood, has been known on lantern clocks for many years, but only recently has anything much been uncovered about his life. Sometimes his name is spelled with one l and sometimes with two. Even the clerk who wrote out William's will was inconsistent, spelling it both of these ways apparently at random, and even once as Shellwood, though the latter is probably just a slip of the pen as the next two names he wrote began with Sh. Perhaps he had over indulged in Mermaid ale. The will exists only as a copy will, called an 'enrolled' will, hence we cannot see William's own signature, but the implication from the wording is that he signed his name Sellwood. The spelling of his name on his clocks seems to be split almost equally between the two versions. I've opted for Selwood, which seems to predominate. William's birth was unknown until discovered recently by John Robey, publisher of Mayfield Books. He was baptised in 1607 at Appleton with Eaton, near Abingdon in Berkshire, the son of a yeoman farmer. His younger brother, John, was baptised there in 1613. William was making clocks in London before the formation of the Clockmakers' Company in 1631. His brother, John, came to join him in the business at a later date. If we assume they were making clocks by, but not before, the age of twenty one, that would put William's date of starting work in his craft at about 1628 and John's at about 1634. William Selwood was probably apprenticed to a lantern clock maker, as was his brother, John, but if so, we don't know who that master was. William would have been apprenticed about 1621, and at that time there were precious few who could have taught him. Robert Harvey, the first native-born maker of lantern clocks in London, by whom only four examples are known to survive today, had died in 1615. Of those who made lantern clocks by 1621, only two stand out as prolific makers, each of the half dozen others being known through only very few examples today. Peter Closon and William Bowyer are the two most prolific makers of that time. Bowyer was making clocks in Leadenhall Street by the 1620s, Closon 'near Holborne Bridge' by 1630, which makes Bowyer the likeliest in terms of date. However the individual character of each maker's clocks suggests no carryover of style in Selwood's work from either of these men. So we can make no guesses as to who taught him. 1. Lantern clock by William Selwood sold in 1979, number 3 in those listed. Click for closer view. 2. Lantern clock by William Selwood sold in 2004, number 8 in those listed. Click for closer view. Like several other clockmakers working before the forming of the Clockmakers' Company, William had joined whatever city company he felt most aligned to, or maybe whatever company would take him. The company chosen was usually on account of membership of that company by some relative. William had in fact joined the Clothworkers' Company, of which he was already a member prior to 1632, in which year he took on two apprentices through that company, one being Thomas Knifton, the other Henry Ireland. Both of these later became famous makers of lantern clocks themselves. William Selwood met the problem faced by several clockmakers already working by 1631, in that as from 1631 he was expected to join, pay allegiance and financial contributions to the newly-formed Company of Clockmakers. But he was already doing this to his own company of Clothworkers. These men trapped between companies were asked to pay twice. For this reason many clockmakers set off with and maintained a lifelong hostility towards the Clockmakers' Company in the early years after its foundation. In April 1633 William Selwood became a free Brother of the Clockmakers' Company. John became a free Brother of that same company of Clockmakers in January 1641. A 'Brother' was someone who had not trained under the auspices of that particular company, and therefore was a second-class member. A Brother could not take on an apprentice except 'through' a full Freeman as intermediary. It seems this category of Brother was regarded as inferior to that of a full Freeman, but then as nobody could have trained under the company before it was formed, it is difficult to see how anyone could enter as a full 'Freeman'. The rules seem to have been bent to suit those who formed the administration, many of them staunch Royalists, some of them Frenchmen, a situation which persisted for years and caused endless friction. These dates of the Selwoods' entering the Clockmakers' Company signify the time when they began to conform to the new requirement for them to join that company, not the dates they began making clocks. There is every likelihood that both worked at clockmaking before those dates, William commencing somewhere after 1628 and before 1632, John after 1634 and before 1641. The Clockmakers' Company fined William Selwood in 1638, probably for infringements of their rules about binding apprentices. In 1651 he was brought before the Lord Mayor for a more severe warning for the same offence again. Such fines and warnings were not unusual at a time when clockmakers were trapped in this problem of a dual allegiance to more than one company. Only a single clock is documented bearing John Selwood's name. I have never seen it, but it is said to be dated 1642. Years ago I discovered that John married in 1642, June 30th, to Dorothy Brookes. What we did not know, until John Robey discovered it recently, was that at the time of their marriage John was almost twenty nine and Dorothy was only a few days older than sixteen! Their son, John, thought to be the eldest of their children, is believed to have been born before the marriage, when the mother was only fifteen years old. John took Thomas Loomes as an apprentice about 1642 (Thomas being freed in 1649) and then took Richard Beck in 1646 and Simon Dudson in 1647. Beck and Loomes were both later known as makers of lantern clocks. John Selwood died late in 1651, his widow, Dorothy, very soon after in that same winter. John left no will, his widow did, though it is not very informative. After John's death William Selwood continued on his own at the Mermaid, with of course his numerous apprentices and assistants. We know he had taken Thomas Knifton as apprentice from 1632. Knifton later took up his freedom through the Clothworkers Company in 1640, and by 1648 had become established in his own right making lantern clocks in direct competition to the Mermaid within his own premises at the sign of 'the Cross Keys in Lothbury', and at one time at 'the Drapers' Arms in Lothbury'. Henry Ireland was later working on his own at 'the dial in Lothbury', though strangely did not take up his Clockmakers' Company freedom till 1655, after William Selwood had died. It seems that William Selwood still had considerable regard for Henry Ireland, as in his will he left a bequest of ten pounds to Henry's eldest daughter. It might well be that Ireland remained as one of the Selwood work force till William's death in 1653. This might help explain why so very few clocks are known by Henry Ireland, even though he lived for almost twenty years more and had an independent working life almost as long as Knifton's, who died in 1667. Very many clocks are known by Thomas Knifton, one of the most prolific of all makers of lantern clocks. 3. Countwheel of the clock in plate 2 showing the matchstick man casting mark. Click for closer view. William Selwood also took as apprentices Tobias Davis in 1640, Samuel Davis in 1641, William Clark in 1648, and Edward Norris in 1650. Samuel Davis also left to set up independently as a rival by about 1650 at the sign of the Golden Ball in Lothbury. Edward Norris set up on his own after William Selwood's death (i.e. post 1653) making lantern clocks 'at the White House in Bartholomew Lane' and later 'at the Cross Keys in Bethlem'. Additionally William Selwood continued to employ those workmen and/or apprentices of his late brother, John, and also those of their journeyman, Thomas Loomes. These included Richard Beck (who remained with the house of Selwood till William's death, after which he set up on his own making lantern clocks 'at the French Church'); Simon Dudson, who is believed to have traded at Tower Street but died not long after William Selwood; Thomas Wilmot, believed later to have worked in the Hague with Ahasuerus Fromanteel (Thomas Loomes's father-in-law). The Selwood work force was absolutely massive, like a small factory. The Clockmakers' Company permitted maximum was two apprentices! William remained a bachelor all his life, dying in the Spring of 1653 aged about forty six, by then quite a prosperous man. Some years ago I traced William Selwood's will, which was written on 30th March 1653, when, as the phrasing of the time goes, he was 'sicke in body but of good and perfect memory'. It was essential to stress one's mental state to avoid the will's being contested later. As well as various members of the Selwood family, he mentions his 'three men servants' Toby Davis, William Clarke and Edward Norris, to each of whom he left six pounds. He also mentioned one Thomas Smyth, 'graver' (=engraver) and forgave him what debts he owed William - 'all such monies or whatever else he oweth me'. We don't know anything about Thomas Smyth, but it seems more than likely that it was he who engraved the Selwood dials. William left properties he owned in Grantham Lane and Thames Street to his nephew, as well as a bequest of ten pounds to the poor of the parish and other small bequests. After William Selwood died, Thomas Loomes took over the business. The very next year (1654) Thomas married Mary the daughter of the famous Ahasuerus Fromanteel, the man who was to bring the pendulum to Britain in 1658. This meant that the Mermaid company was now allied to perhaps the most prestigious clockmaking house in London - which was in fact located south of the river Thames in Southwark, where the authority of the Clockmakers' Company held little sway. In a sense the arrival of Fromanteel's pendulum, and with it the longcase clock, heralded the death of the lantern clock. Although the lantern clock continued in production for the best part of half a century (and soon itself incorporating pendulum control), its days were numbered, as the longcase did everything the lantern clock could do and did it better. In Southwark Fromanteel continued to pay scant regard to the Company's rules. It is doubtful whether the Company authority was effective there anyway. In any case these rules were loaded very much in favour of the Royalist administration, who were never likely to get along with Fromanteel, a man who paid money to support Cromwell's cause, or his son-in-law, Thomas Loomes, who later spent time in prison for harbouring Cromwellian fugitives in his house. So close was the connection of Fromanteel with Oliver Cromwell, that he obtained his Freedom of the City of London 'in the Company of Clockmakers' in 1656 by a letter of instruction direct to the Lord Mayor signed by Oliver Cromwell in person. Fromanteel had been a brother of the Company since 1632, an incredible twenty four years. It was virtually unknown for an 'early' brother to be refused full Freedom for this length of time, but this had been done out of spite by the Company administration, whom Cromwell over-ruled with the stroke of a pen. The continued flagrant abuse at the Mermaid of the rules concerning the numbers of apprentices, which had been widely breached in the days of William Selwood's control, came to a head in 1656, at an unruly Company meeting where uncivil words were spoken and the result was that Thomas Loomes was fined by the Clockmakers' Company for having five apprentices instead of the permitted two. In fact he seems to have had more like a dozen! The Company punished Thomas Loomes because they could not punish Fromanteel. Ahasuerus Fromanteel was never a man to mince his words. He later wrote a letter of 'apology', in which he acknowledged that harsh words had been spoken on both sides that did not become Christians and civil men, that he ought not to have said that his own journeyman could get through more work than any five of the administration put together - even thought it was true! Apart from an early proponent such as Robert Harvey, lantern clock making began hesitantly in the 1620s by makers randomly scattered around the capital. By 1650 the majority of these makers were centred on Lothbury. In 1662 a survey of the members of the Clockmakers' Company counted thirty-seven workers (clockmakers, watchmakers and engravers) in the parish of St. Margaret's Lothbury, more than in any other city district. Almost all of these were makers were trained up through the Selwood establishment. One exception was Nicholas Coxeter who traded at 'the Three Chaires' in Lothbury from the 1640s. But for the most part it is true to say that it was William Selwood at the Mermaid in Lothbury who was responsible for the distribution and concentration of the lantern clock trade in Lothbury and the immediate vicinity. Most of the names of those lantern clock makers in the Lothbury district, whom we regard to day as being amongst the best makers, were trained in the establishment of William Selwood. Many of these individual clockmakers scattered to set up independently immediately following William's death. The Selwood empire was taken over on William's death by Thomas Loomes, still only twenty-six years old. His marriage to Fromanteel's daughter in 1654 meant they became part of the more prestigious Fromanteel empire, with the Mermaid running as a branch for the next ten years. Thomas Loomes last paid rates of eight shillings eight pence a year at the end of 1664. In 1665 the Plague struck, its spread accelerated by the hottest summer in living memory. Those who could fled to the country, including the Fromanteel family, who moved temporarily to Colchester, but who were forced to move on again as the plague followed them there. There is a suggestion that Fromanteel himself survived an attack of the plague, which left him pock-marked. Thomas Loomes is believed to have stayed on at the Mermaid and by the end of 1665 he was dead, believed a victim of the plague. At the end of 1665 the rates were paid by the ultimate successor of the Mermaid, Thomas Bagley, still there with the only other surviving Mermaid workman, Edward Sedwell, who himself is believed to have died soon after. In 1666 the Great Fire swept through London, and on its third day of raging totally destroyed the entire Lothbury district. Not a single workshop survived. The Mermaid in Lothbury, William Selwood's empire, disappeared without trace but left in its wake the 'Lothbury' school of lantern clock making. The lantern clock pictured here came onto the market recently and offered a new opportunity to examine his life and some aspects of his work. We would expect him to have made exclusively balance-wheel lantern clocks, as the pendulum was not introduced to clockmaking till several years after his death. It is thought that all balance wheel lantern clocks were later converted to one or other forms of pendulum control for greater accuracy and also often to modify them to a longer duration, as balance wheel clocks might need winding as often as every eight hours. A modification to pendulum would often allow thirty-hours between windings. 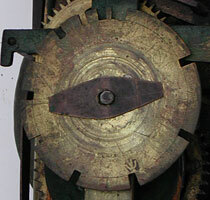 Those clocks we see today with balance wheel control are all thought to be conversions back to the original escapement. Experts disagree as to whether any example of a lantern clock survives today with its original balance wheel system. This present clock appears to have its original side doors, which seldom seem to survive. On these are scratched dates of servicing or repair, a regular practice of restorers over the years. Here the dates which can be read are: June 1749, November 12 1756, May 12 1757, June 1795, June 17 1796, March 1800, May 20 1802?, July 8 1805 'repaired', January 16 1821, October 6 1825. Some of the brasscasters left an impressed trade mark in the castings they supplied. The 'matchstick man' is a name given to the small figure of a man which appears on castings on a number of mid seventeenth century clocks. This casting mark has so far been recorded in George White's book, 'English Lantern Clocks', based on information supplied by Jeremy Evans of the British Museum, on fifteen different clocks, the majority of them lantern clocks. This 'matchstick man' casting mark appears on the countwheel of this particular William Selwood clock (plate 3) and also, though much more indistinctly, on the star behind the dial wheel. The identity of this brass caster remains unknown, but his marked castings are known on clocks by makers, which include William Selwood (working 1628-1653), Peter Closon (working 1630-1660), Thomas Knifton (working 1640-d.1667), Nicholas Coxeter (working 1646-d.1697), John Lyon of Warrington on a clock believed supplied to him from London (working 1658-1678), Hilkiah Bedford (working 1653-1668), John Ebsworth (working 1665-d.1699). The approximate date of each individual clock is unknown, but this spread of years means we can put the dates during which these castings are known to fall as being within the span of about 1630 or a little later to about 1680 or a little later, almost half a century. This means it is likely to have been a brass-casting 'house' of more than one generation, rather than the work of one individual man. Recorded examples of lantern clocks by William Selwood are few in number. They include the following ones, which happen to be ones I know of, though mostly only through photographs. Some of these would seem, to say the least, a bit suspect. 'William Selwood at ye Maremaid in Louthbury', signed on heraldic front fret, with alarm disc, left-hand hammer suggesting a pendulum clock, illustrated in 'The Beauty of Clocks' by Michael Pearson. But the pendulum was not introduced till 1658. 'William Selwood at ye Marmaid in Louthbury fecit', signed on heraldic fret, no alarm, originally balance wheel now long pendulum, said to be c.1635, illustrated in 'English 30 Hour Clocks' by Jeff Darken and John Hooper. Apparently one of the earlier examples by this maker. 'William Sellwood at ye Mermayd in Lothbury', signed on heraldic fret, formerly with alarm, originally balance wheel, sold by me about 1979, later illustrated in 'The Arthur Negus Guide to English Clocks' by David Barker, and also in 'The Early Clockmakers of Great Britain' by Brian Loomes (the latter with replaced alarm disc). Pictured here (plate 1). 'William Sellwood at ye Mermayde in Lothbury', signed on heraldic fret, no alarm, balance wheel, illustrated 'English Lantern Clocks' by W. F. J. Hana. 'William Selwood at ye Maremade in Lothbury' (signature illegible in the photograph but supposedly signed this way), signed on heraldic fret, no alarm, balance wheel, illustrated 'Old Clocks' by H. Alan Lloyd. 'William Sellwood at ye Mermayd in Lothbury' (signature illegible in the photograph but supposedly signed this way), signed on heraldic front fret, alarm disc, originally balance wheel, sold at Stuttgarter Kunstauctionshaus, Stuttgart, Germany December 1991. 'William Sellwood at ye Mermayde in Lothbury' (signature illegible but supposedly signed this way), signed on a lion and unicorn fret, originally balance wheel, now converted to anchor, sold at Sothebys, London 1994. 'William Selwood at the Mermayed in Lothbury', signed on heraldic fret, no alarm, balance wheel, illustrated here. Matchstick man casting mark on countwheel. 'William Sellwood fecit' a signature originally hidden by the alarm disc on a lantern clock now lacking its frets (and therefore maker's, or retailer's, signature) originally with balance wheel, illustrated in 'English Lantern Clocks' by George White, the clock now in the Marischal Anthropological Museum of the University of Aberdeen. The hidden nature of this signature implies that Selwood was making clocks for others to retail. The signature is followed by the date 1621, which we now know was when William Selwood would have been fourteen years old! This unlikely 'date', together with the fact that the clock is in a style earlier than others by this maker, might call into question whether this clock was actually made by Selwood.